We are your resource for linking, preserving, and supporting family history for future generations to come. Become a member of Upchurch & Allied Families Association (UAFA) today. To enroll and support UAFA, please choose one of the following two options: 1) Enroll & Support UAFA Online through PayPal, or 2) Enroll & Support UAFA by Mail. Thank you for your support! and click on the Add to Cart Button. Current year subscription to the UAFA Newsletter. Provide additional financial support to UAFA as an Archivist. Provide additional financial support to UAFA as a Preserver. Provide additional financial support to UAFA as a Finder. Provide additional financial support to UAFA as a Seeker. This option provides full lifetime membership in UAFA for you and all of your family members. This can be paid in full or in increments. This option will keep Allied Families viable and dynamic into the future. 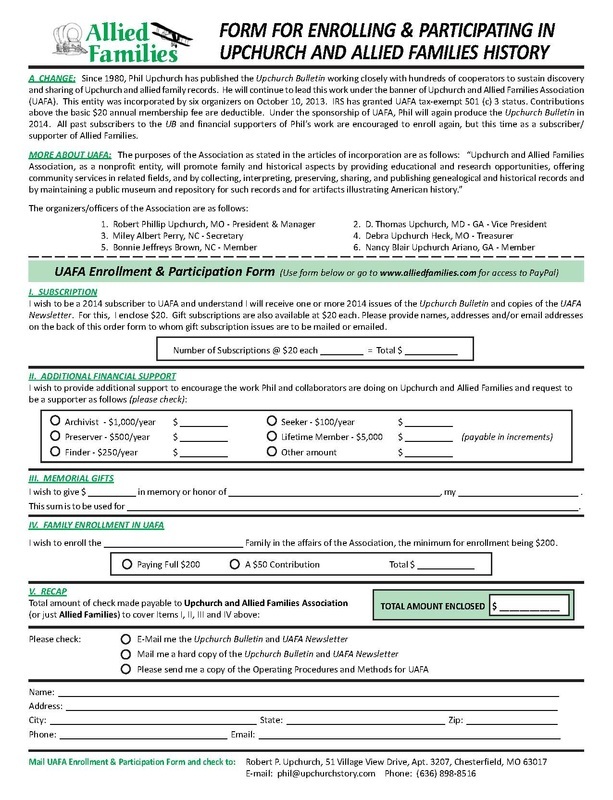 UAFA Enrollment & Participation Form shown below.